On the island Uløya in Troms, Norway. 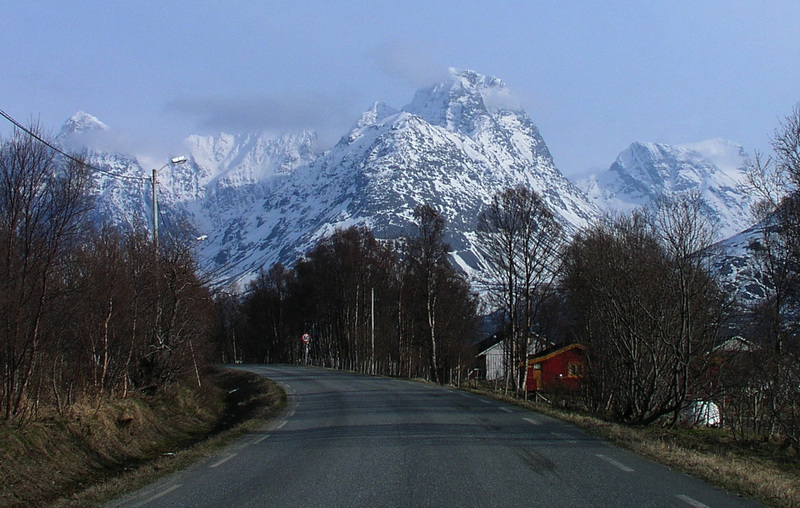 How to get there: This mountain is located near Sørkjosen in Northern Troms. There are two alternative ways to drive from Tromsø: One can depend on two ferries and drive 100 kilometer from Tromsø, or one can drive 218 kilometer without any ferry at all. The first alternative is to drive from Tromsø south on E8 to Fagernes, then Hwy. 91 to Breivikeidet and take the ferry to Svensby. 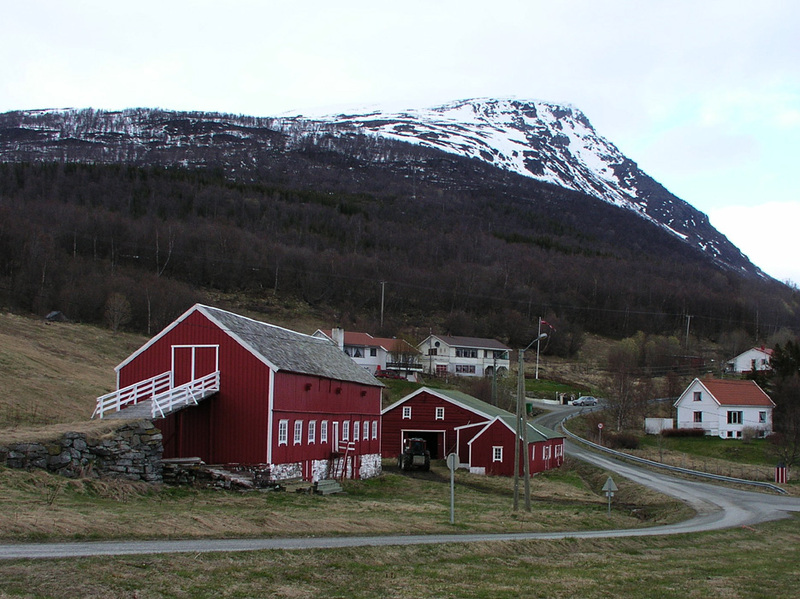 From there, drive 22 kilometer to Lyngseidet and take a new ferry across to Olderdalen. I waited about 30 minutes for the first ferry, then close to 1:30 for the second ferry. They told that the ferries would correspond better as soon as the tourist season started. (too bad for the locals!) There is no question that the longer route would have paid off with respect to time and cost. The longer route proceeds 71 kilometer south from Tromsø to Nordkjosbotn via Hwy. E8, then 147 kilometer north along Hwy. E6. 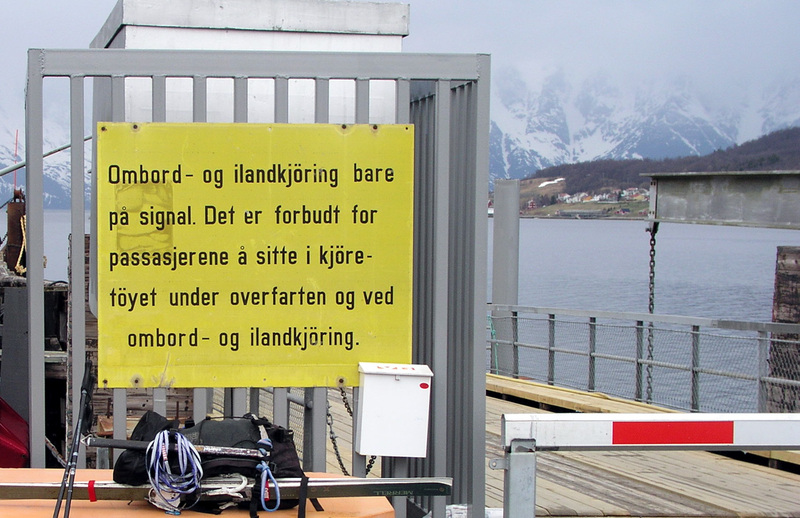 Since this mountain is on the island Uløya, a last ferry is needed, however, one should park the car on the mainland, that is, the parking area at the ferry on the mainland is the trailhead. This place has coordinates north 69:47.072, east 020:37.116, elevation 4 meter. A good place to stay is Henriksen Gjestestue in Sørkjosen, this is about 18 kilometer further north along Hwy. E6. His place is on the right hand side of the road just opposite a Statoil gas station. Again, great service, very nice rooms and a good price (NOK 575). His phone number is (+47)77767677. There are several restaurants a bit further along (north) on E6, I had a pretty good Mexican dinner. Route description: From the trailhead, first take the ferry across to Havnnes. This ferry leaves between 5 and 8 times a day. The first ferry leaves around 0700 on weekdays, Sunday as late as 1000. The last ferry returning perhaps as early as 1900. The schedule for the ferries in Troms is on the internet, see this for updated information or call 177 for the current schedule. 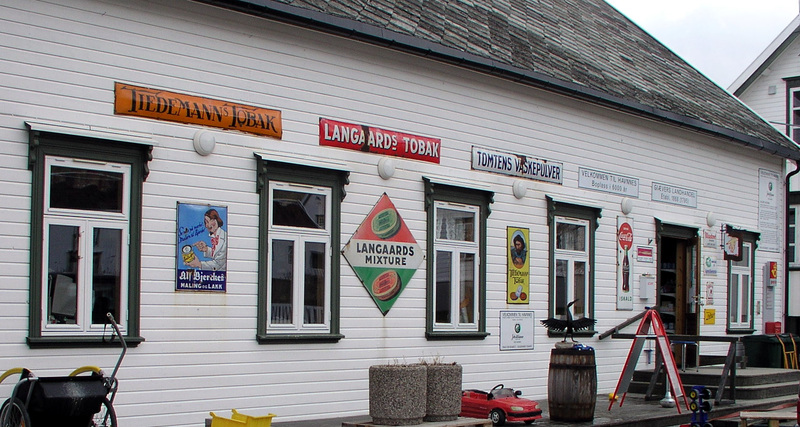 Havnnes is an old trading post, perhaps further north than any other in continuous operation for several hundred years. 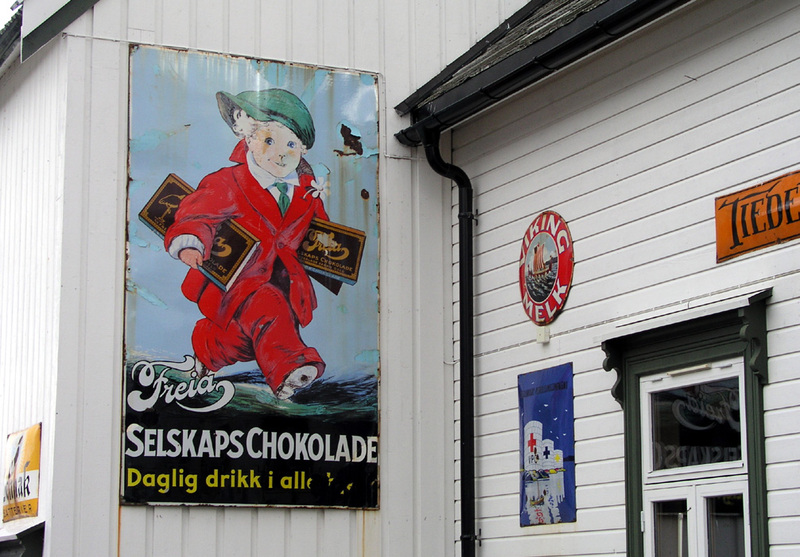 The store is charming, in particular, many old signs are indeed very nice. From the ferry, head up the road, take the left branch, then almost immediately a smaller dirt road that forks right. This road passes large racks with dried fish, then heads up into the forest. As you get higher, try to follow the trail or path that in winter may be visible only because the trees provide a corridor. This trail makes a pretty long traverse to the left (north-west), then a silmilarly long traverse to the right before breaking away from the trees near some small cliffs. You are above the vegetation at location north 69:47.908, east 020:34.588, elevation 343 meter. Continue straight up the ridge, the slope is just perfect for skiing. As you approach 1000 meter, stay right of the small local point 1034. The route now enters a ridge, in winter there is a substantial cornice on your right side, but also the steep left side demands caution. The passage is short and actually pretty wide, however, when I crossed in a complete white-out, the place is not to be taken lightly. The ridge now turns a bit left (to north) and the route onwards to Uløytinden 1114 m is pretty easy. From this summit, continue down to the 967 meter saddle, then about 1.5 kilometer further north to the highest summit on the island, Blåtinden. Along the entire route, the cliffs on the right (east) are steep with overhanging cornices, one should stay clear with "double margin". Approach the cairn with caution. In good weather one should return the same way, this route provide fantastic views across to the Lyngen penisula. In bad weather (like I had), one can return down from the summit to the west. The entire slope on this side can be skied except the area west of Uløytinden with the steep sides of Gahpervaggi. Comments: I climbed this peak solo, the conditions at the higher elevation, above 900 meter were quite bad indeed. In the morning, the weather looked very bad, snow was coming down pretty heavy outside my window. I decided to gamble on a late start. The latest possible ferry was 1145, I still had to make the last return ferry at 1915. The bet seemed to pay off, blue patches of sky and brief periods of sunshine as I drove to the ferry and this weather continued in the very first part of my climb. I started hiking at 1200, arrived at the summit at 1515, spent 15 minutes there and returned to Havnnes at 1730. Much to my surprise, a ferry arrived and took me across around 1815, in complete disagreement with any posted schedule. The trip at the higher part of this peak became quite challenging. Clouds and pretty strong wind with white-out conditions. I navigated carefully across the ridge system to Uløytinden, taking numerous GPS waypoints in order to secure a safe return as well as verifying that my position was correct. After visiting Uløytinden, I continued to Blåtinden staying safely on the west slope until I was near the summit. I measured the summit cairn 5 meter lower than the map, while my GPS found somewhat higher ground a bit further along (north of the cairn) the ridge. The weather continued to get worse and I decided that the safest descent would be to drop down on the west side. In order to minimize the return hike, I therefore skied down on a south-west course until hitting the rather steep valley Gahpervaggi west of Uløytinden. It was possible to ski into this valley slightly above the 400 meter contour. I continued my plan and eventually descended to the road at the farm Skilet. From there, about 3 kilometer hike along the road back to Havnnes. s was peak number 10 in my T5 trip. Next peak Stormauken. Previous peak Vanntinden. View from Breivika on the way to Uløya (waiting for the ferry). Driving to Lyngseidet, it is hard to focus on the road. The lower part of Blåtinden. 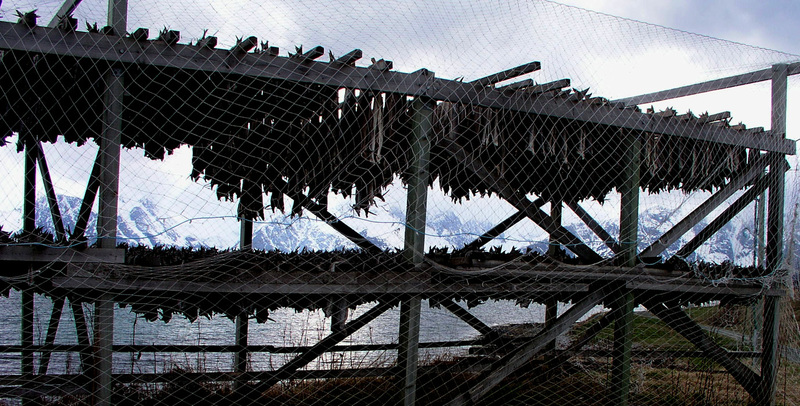 Dry fish, a very old product. View across to Lyngen when descending from Blåtinden.